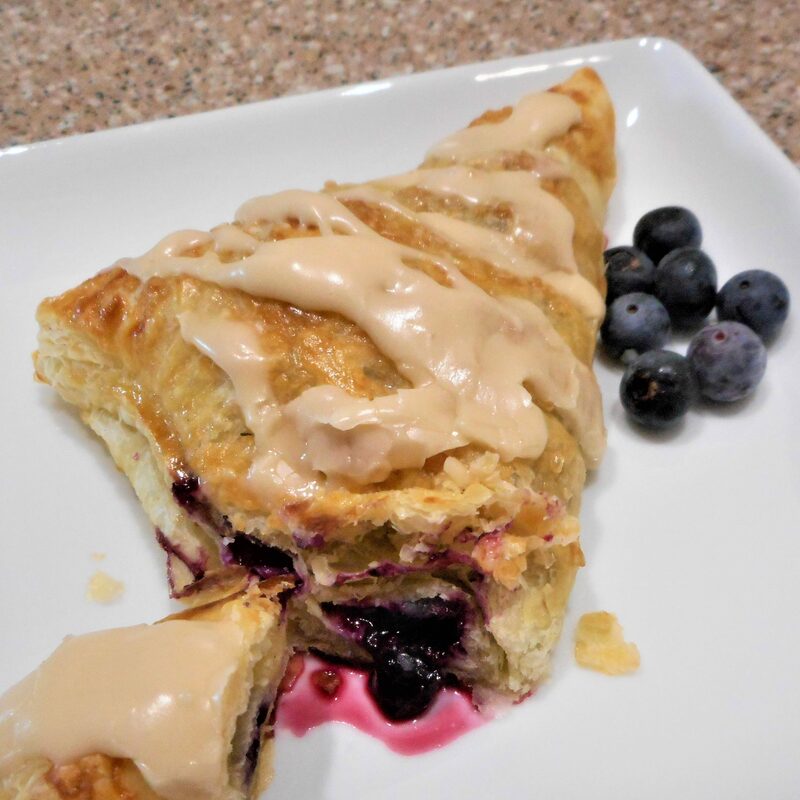 Breakfast or dessert, Blueberry Turnovers are an easily prepared delight. Other fruits will work as well. 1. Thaw puff pastry according to package directions. On a lightly floured surface, roll pastry into a square, pressing smooth the creases. Cut the pastry across the center in both directions to form four squares. 2. Mound 1/4 cup of berries on each pastry square. 3. Whisk together the egg and 1 tsp water, then brush some of the egg wash along each edge of the pastry squares. 4. Fold the pastry up over the berries to form a triangle. Press the edges firmly together to seal and brush more egg wash over the top of each turnover, then sprinkle the tops with sugar. Place on a baking sheet. 5. Chill the turnovers in the freezer for 10 minutes while pre-heating the oven to 400°. 6. Bake the turnovers for 15 minutes or until golden brown and flaky. 7. While the turnovers are cooling, stir together the powdered sugar, vanilla, and cream until smooth, adding a little more cream if needed. 8. Drizzle the tops of the turnovers with the icing when they are no longer hot, but just warm, and serve.